We’ve barely recovered from Canada and now F1 is back in action at the brand new Baku circuit for Round 8. Here’s our list of 5 things we’re excited to see this weekend. Can Nico Rosberg halt Hamilton’s momentum this weekend? Just a few weeks ago I was saying how badly Lewis Hamilton needed a win to halt his Nico Rosberg’s momentum, but just a couple of races later the tables have turned in dramatic fashion. 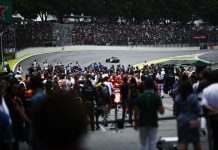 Had Rosberg managed to convert his early lead into a victory at the Spanish Grand Prix, he would have lead his teammate in the championship by at least FIFTY points. Now, as the teams head to the shiny new home of the ‘European’ Grand Prix, Rosberg knows that if results don’t go his way this weekend, he could lose the lead of the championship. The Baku track will suit Mercedes, so both drivers will be in contention for the win. After being out-muscled at the first corner in Montreal, Rosberg might need to get his elbows out this weekend. Is Ferrari’s turbo upgrade about to save Arrivabene’s job? The upgrade that Ferrari brought to Montreal made a noticeable different to the team’s pace in both qualifying and the race. Still without a win in 2016, I suggested before last week’s race that a bad weekend for the Scuderia could increase the pressure on team boss Mauricio Arrivabene after criticism this season from the Italian media. After Red Bull’s recent resurgence, Ferrari returned to their role as Mercedes’ main rival in Montreal, and perhaps could have even won the race had they been aggressive enough to attempt a one-stop strategy. Baku has been compared to other street circuits like Monaco and Singapore, but with its long straights and higher average speed it is arguably more similar to Montreal. This bodes well for Ferrari, and with their new turbo upgrade they should be able to stay with Mercedes in quicker sections of the track. Ferrari badly need a win, but if they can get their strategy right this weekend they may have a chance to end their 13 race losing streak. Can Williams build on their strong showing in Montreal? Williams returned to the podium last weekend, their first visit since the Mexican Grand Prix late last year. The Circuit Gilles Villeneuve was expected to suit Williams’ car and Valtteri Bottas duly delivered his second Montreal podium in as many years. With the Baku circuit similar in some ways to Montreal, Williams have a good chance of returning to the podium again this weekend, but the one thing that may halt their progress is parts, or to be more precise, a lack of them. Felipe Massa admitted this week that his side of the garage are low on spare parts after his huge crash in practice last weekend, and with his contract expiring at the end of the year he’ll be particularly keen to avoid the Baku barriers this weekend. Will the Baku barriers prove a little too close for comfort? Jenson Button was quite vocal about the circuit layout on Thursday and expressed his concerns that Formula One had taken backwards step in safety by staging a Grand Prix on the streets of Baku. The track is unique, combining a super long straight with top speeds expected to be similar to Monza, followed by some of the tightest corners ever seen on a Formula One track. 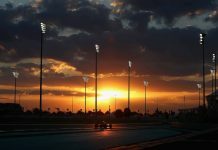 One particular section, turns 8-10, appear to stretch the limits of how tight and narrow a Formula One track can realistically be, and whilst it is visually stunning, it has the potential to cause significant problems if someone runs out of talent during the race. Just 7.6m wide at its narrowest point, it will be almost impossible for two cars to safely pass through side-by-side, and if someone were to spin or collide with the wall, a red flag seems inevitable as retrieving a stricken car there will be difficult. Will we see a surprise winner this weekend? The form guide would suggest not, but looking back through recent seasons I noticed an interesting statistic, and we all love statistics right? Each time Formula One has raced at a new track in the past decade only once has the championship leader at the time gone on to win the race. During that period, there have been six new tracks (Austin, India, Korea, Abu Dhabi, Singapore and Valencia). In each track’s debut race, only once (Sebastian Vettel in 2011) has the championship leader been the victor. Lewis said this week that he’s neither a fan of track walks or simulators and believes he can learn a new track in just a few laps. Maybe it means nothing, but it’s interesting don’t you think?